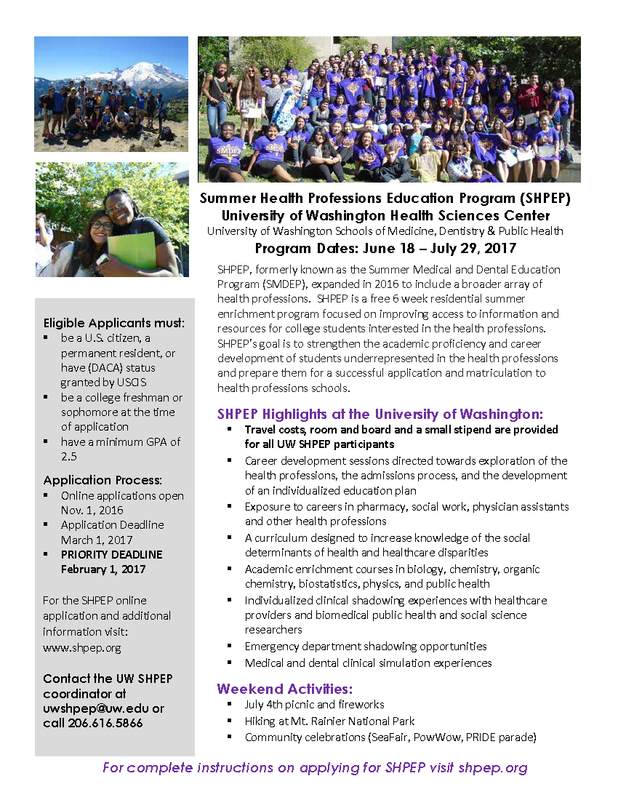 Are you a college freshman or sophomore seeking a summer career-enrichment opportunity within the health professions? Register today to join the upcoming Summer Health Professions Education Program (SHPEP) webinar and get an in-depth look into all the program has to offer. The webinar will occur Thursday, January 26, 2017 @ 5 PM EST (2PM PST). Register today for the SHPEP webinar to learn the first-hand experience of past SHPEP scholars who successfully completed the 6-week summer career-enrichment experience! Webinar panelists will include SHPEP alumni and ambassadors who will discuss the academic possibilities they obtained, thanks to their educational experience at the SHPEP. The University of Iowa will also offer great tips and insight to potential applicants eager to apply. Formerly SMDEP (Summer Medical and Dental Education Program), the program expanded in 2016 to include a broader range of health professions beyond medicine and dentistry to include pharmacy, nursing, optometry, public health, physical therapy and physician assistant. Participation in the summer enrichment program may better position students for acceptance into advanced degree programs. Students should visit www.shpep.org to learn more and apply to the SHPEP today. The application process opened November 1, and for the first time is open to DACA students as well. The deadline for priority consideration is February 1. The application deadline is March 1, 2017. UW Phys Asst program info sessions; sign up now!